To help relax the body, master herbalists have long believed that you must first “calm the mind” and that certain herbs work to balance and quiet the mind - essential before true relaxation or a good night’s sleep can be experienced. 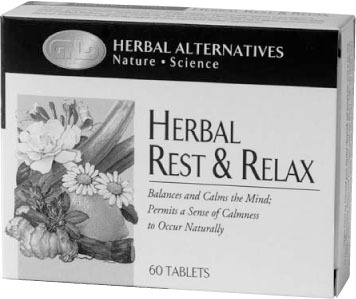 GNLD’s Herbal Rest & Relax contains a unique blend of herbs formulated to support a relaxed body and quiet mind which is essential for optimal rest and a good night’s sleep. Why Choose Herbs For Relaxation? Because herbs work naturally and gently to calm the body and mind, to support relaxation and sleep. Because herbs have been shown to restore the body’s balance and help the body perform at its vital best. Because herbs have been shown to help relieve nervous stress and mild anxiety and relieve sleeplessness. 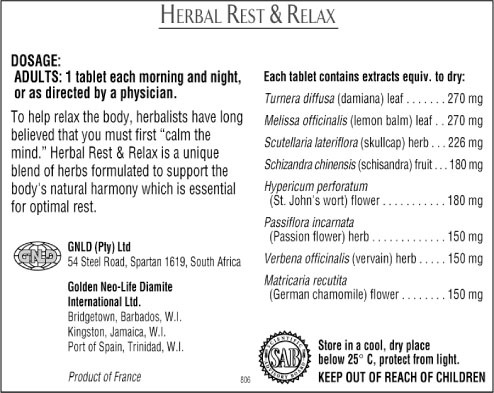 Why GNLD Herbal Rest & Relax? Comprehensive formula. Our unique “complete family” approach to the formula provides broad, synergistic effects of the herbal constituents, which optimize their ability to support a relaxed body and quiet mind essential for normal sleep function. Contains Lemon Balm and Passion Flower which have been shown to help calm and relax the body, assist in overcoming sleeplessness and mild depression. (Turnera diffusa) Promotes vitality and kidney function, assists in relief from nervous stress. (Melissa officinalis) Calms and relaxes, assists in overcoming sleeplessness and mild depression. (Scutellaria lateriflora) Assists in relief from nervous stress and mild anxiety, aids sleep. (Schizandra chinensis) Assists in overcoming feelings of nervous stress, promotes kidney and liver function, promotes vitality. (Hypericum perforatum) Assists in overcoming nervous stress, mild depression and anxiety. (Passiflora incarnata) Promotes well being, aids sleep, relaxes and calms. (Verbena officinalis) Assists in overcoming nervous stress and sleeplessness. (Matricaria recutita) Calms, relaxes, quiets digestion.